The technology in the cars we drive is developing at an incredible rate. There’s no hiding from the fact that self-driving vehicles will be part of our future, indeed our children may not know anything different when it comes to transport in their adult lives. We recently attended a Ford Australia conference on the future of mobility which was an incredibly thought provoking session, you can read more about it here. For several years now, the manufacturer at the forefront of mobility and it’s development has been Tesla, with Elon Musk’s company producing some incredible vehicles which you see more and more on the roads these days. It was timely that our good friends at Tesla Australia were kind enough to give us a Model X for the weekend, what a treat, seriously, what a treat! 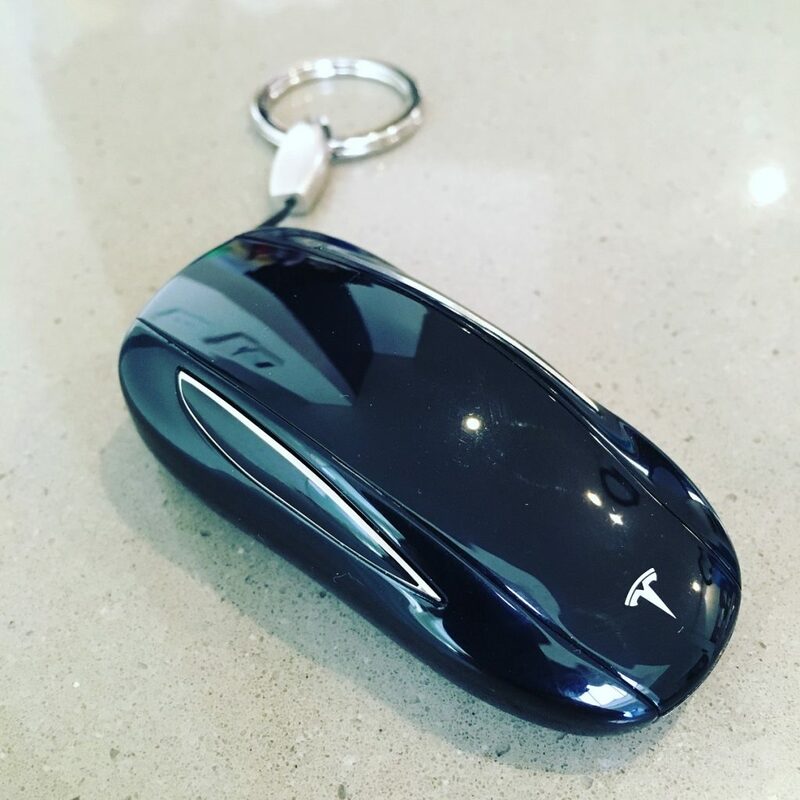 If you haven’t seen the Model X before, let us introduce you to it. It’s Tesla’s first SUV, a six seater sporty looking piece of art. Before we get into the technological side of things, you just need to appreciate the look of this vehicle. Its smooth curves and ergonomics are breathtaking, and it’s obvious from the moment you hit the road, it’s a head turner… so much so, there may well have been several cases of whiplash reported in Sydney over the Queen’s Birthday Long Weekend. 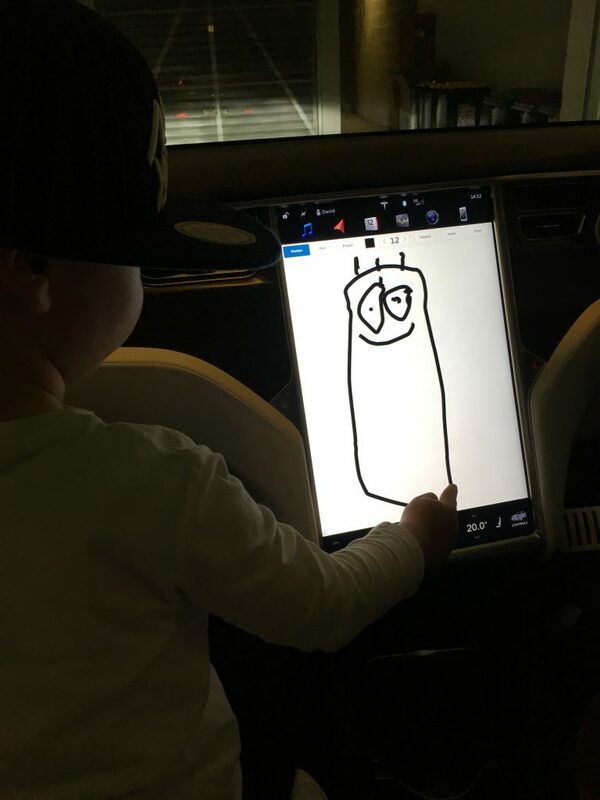 Before you even get in the car, you are hit by the intelligence of the Model X. 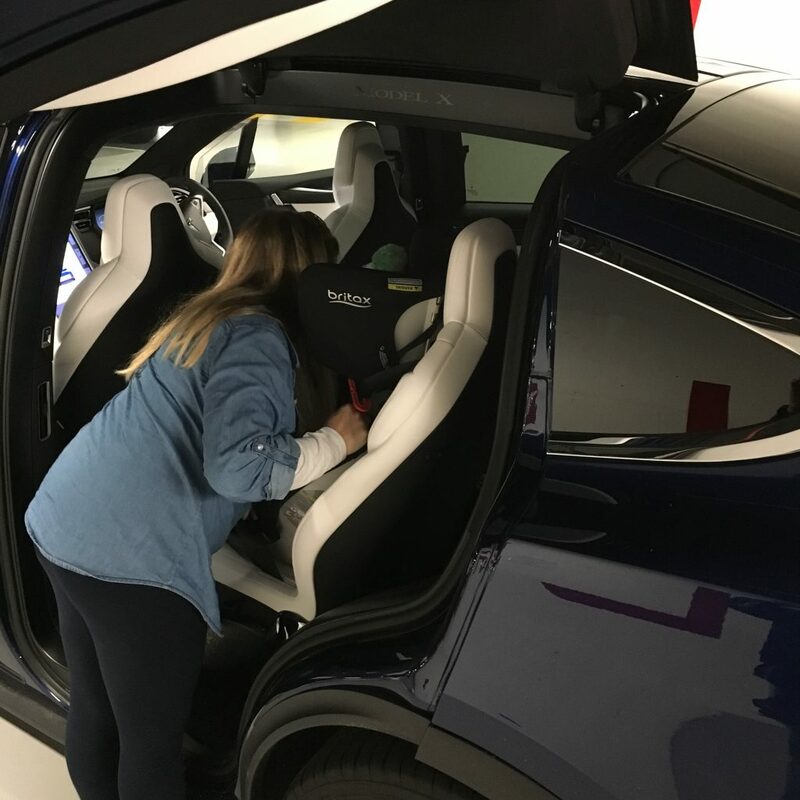 With your key you can open both front doors, both back doors (more on those in a minute) the boot and the front boot or the Frunk (Front Trunk) as the clever fellows at Tesla like to call it. It recognises that you’re in the vicinity of the car and not only unlocks it, it also opens the driver’s side door for you… it’s like having a butler, albeit an invisible one! 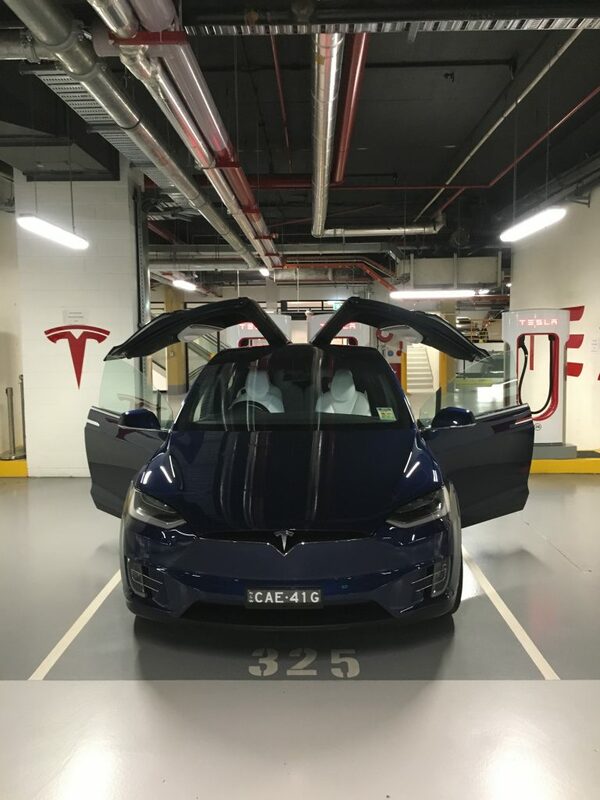 The two passenger side doors are where it gets really cool… bat wing style openings which not only open with the flick of the key or by pressing the handle, they also sense anything around them so will only open a safe distance without hitting other cars or walls you may be parked near. It’s so much fun picking people up and opening the doors for them as they walk towards the car, the look of amazement on their face is something I will never tire of. When you first get into the car you cannot help but notice the incredibly large windscreen. It disappears over your head and beyond, the vision you have from this is amazing, you are not left wanting for visibility which of course, can only be a good thing. On the downside, the rear view mirror is particularly small, I understand the reasoning that Tesla doesn’t want to detract from the phenomenal windscreen, but an extra couple of centimetres of mirror would have helped. As with most cars these days, you can adjust your seating position, your headrest, lumbar support and the steering wheel. This is particularly good when for our family, with me at 6”2 and my wife at 5”1, it can be difficult to find a car that is comfortable for us both. But with so many options for adjustments, this ticks the box. What’s great in the Model X is that you can save profiles so if you and your partner both drive the car, you can change the positions with the press of a button to return it to just how you like it. Heated seats, as you will know if you’re read our other car reviews, are a big plus in a car for us. 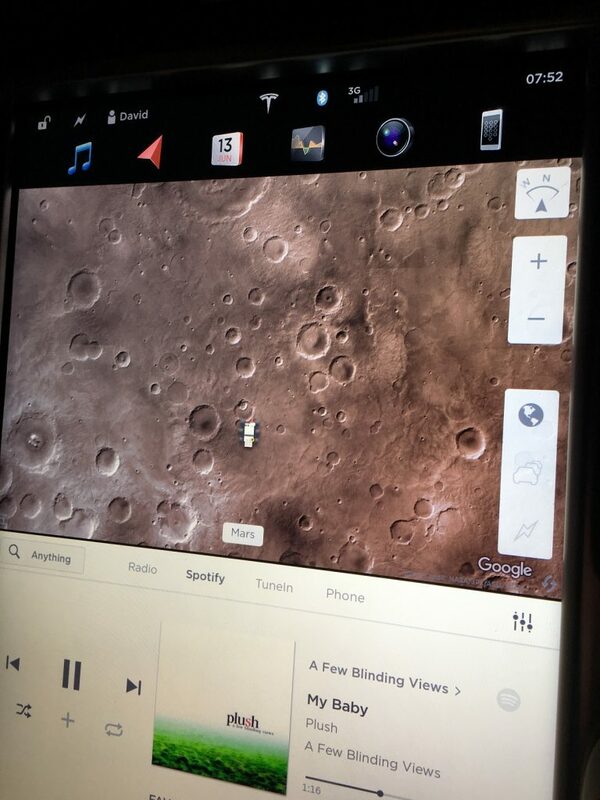 The Tesla takes this to a whole new level, with ALL SIX seats heated with the press of a button on the main control console. In the back there is simply no other car that we’re yet to drive that has such good access for getting babies and children in and out of the car. With both Isofix and anchor points on both rows, you can use any child seat or capsule, but more importantly the batwing doors allow you to get completely in the car from the outside to fasten belts, adjust seats and make your child comfortable. If you choose to have them in the back row, you can move all other seats forward to make space for the same reason. It is so easy to get your child safely strapped in and as a parent, this is always reassuring. If I were to criticise something which is also a cool feature, it would be the ‘skylight’ window built in to the passenger doors, if you have a baby or indeed child of any size in that seat, you’d need to consider adding a shade of some sort to protect them from direct sunlight. When it comes to driving the Tesla, it always take a while to get used to. If you’ve seen our review of the Model S, you’ll know we spoke about the direct correlation between your foot and the movement of the car. Put your foot down, the car moves, take your foot off the pedal, it slows. It’s a very different driving style to a normal petrol car but once you are used to it, it makes perfect sense. 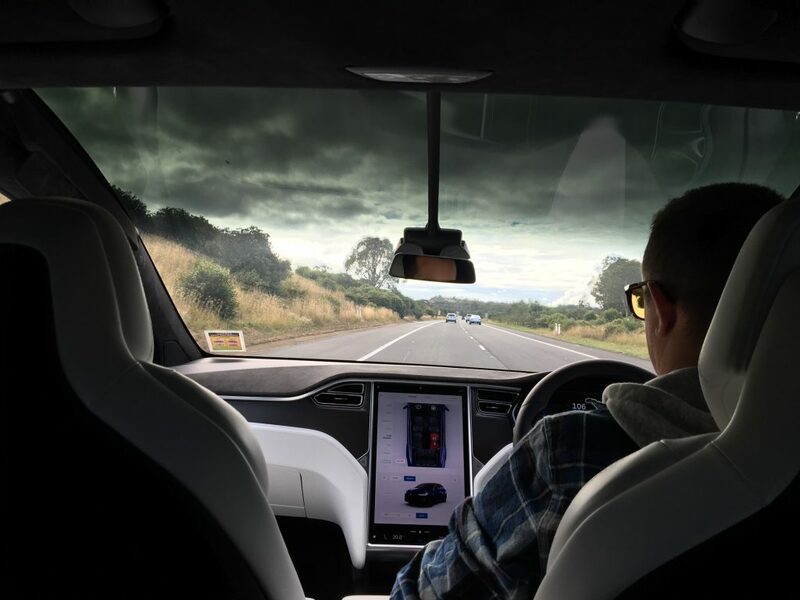 Indeed the whole driving experience of the Model X is an enjoyable one, at no point do you feel like the car or its technology is driving you, it’s all there to make you feel in more control of the vehicle. If you do like acceleration, you’ll love this. It’s INCREDIBLY quick, just flick it into ludicrous mode and you’ll see what I mean, seriously, it’ll knock your socks off! 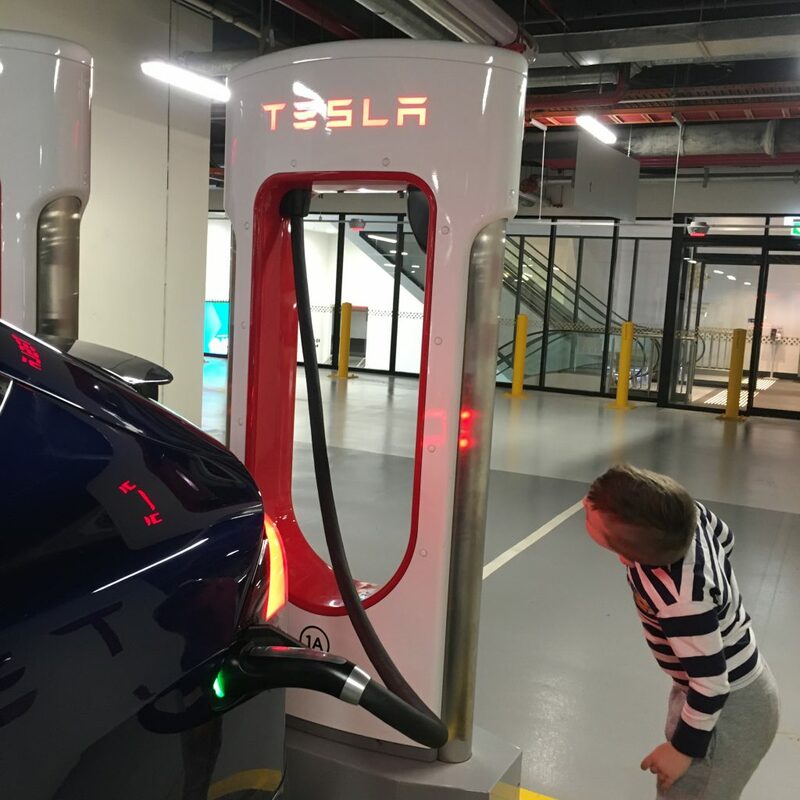 Charging the car is easy if you live near a Super Charger, as it’s quick, free and straightforward, however… DON’T FORGET TO CHARGE. I can vouch for this having set out for a family day out to the NSW Southern Highlands, only to realise that we would be stranded there if we continued on the journey. A basic error from yours truly, but a reminder that you can’t just pull in and fill up with fuel like you can with most of the other cars on the road. On a road trip or a day out though, you never run out of music or playlists to keep you entertained, thanks to Spotify which is built in to the entertainment console along with your WIFI. So, what other things tickled us here at Dads Stuff? Well for a car which is so technologically advanced and incredibly futuristic, there’s some fun little quirks you can find when you explore the control console (which by the way is absolutely massive!). 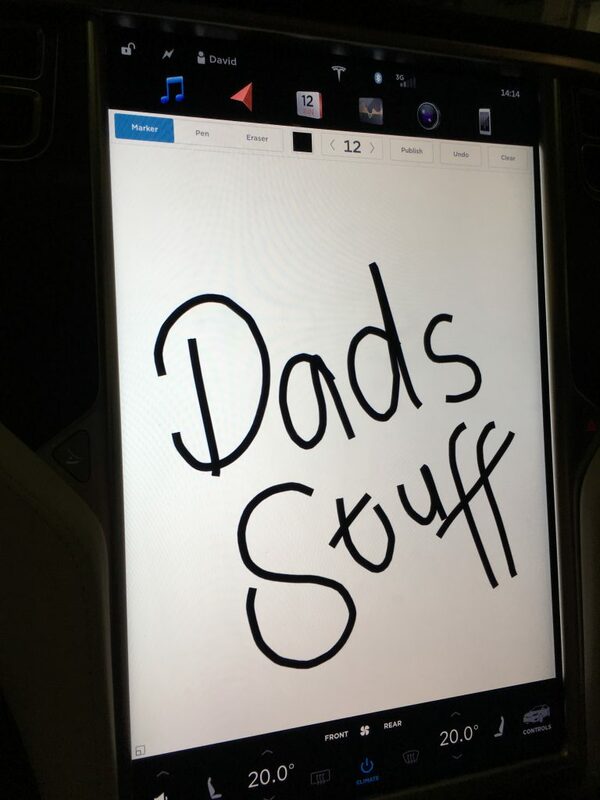 You can draw on pictures using your fingers as the pen or paint brush, something Mr 4.5 years old enjoyed, and indeed the Dads Stuff team did, as you can see below. Our favourite though was discovered by mistake, when we hit a red planet… only to find, 20 minutes later that it had changed the Sat Nav to place us on Mars… really bloody cool! It was interesting to note that Tesla boss Elon Musk wished that he had started the development of the Model X from scratch rather than trying to shoehorn an SUV into the designs stemming from the Model S sedan. Whilst we absolutely loved the Model X, we’re intruiged by how the next generation, compact SUV that is currently in development will differ from both this car and the sedan that Tesla sells. Learning from both options and starting from scratch with an SUV design will surely create a magnificent vehicle. Finally, what’s it worth? Well the vehicle we drove had a few options on it, and you could take it from a cool $306k. Not cheap, but remember, no fuel required, software updates provide you with new features that keep your vehicle at the cutting edge, and it’s an AMAZING car! 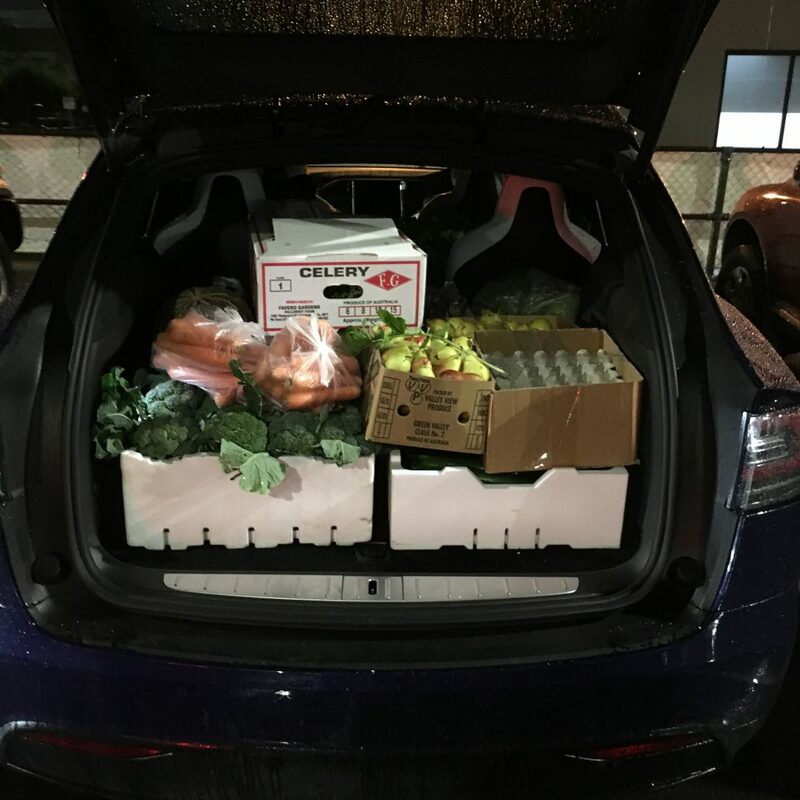 Why is it that any amount of money that seems big is described as ‘cool’… well in the Tesla Model X’s case, it’s because that’s exactly what the car is.